Gary is a versatile potter creating both wheel thrown and hand built pieces. He resides in Travelers Rest, South Carolina and teaches ceramics in Spartanburg SC. He exhibits in several area galleries as well as creating one-of-a-kind commission pieces. See the Gallery page for examples of his work and contact Gary if you would like to place an order for a commissioned piece. 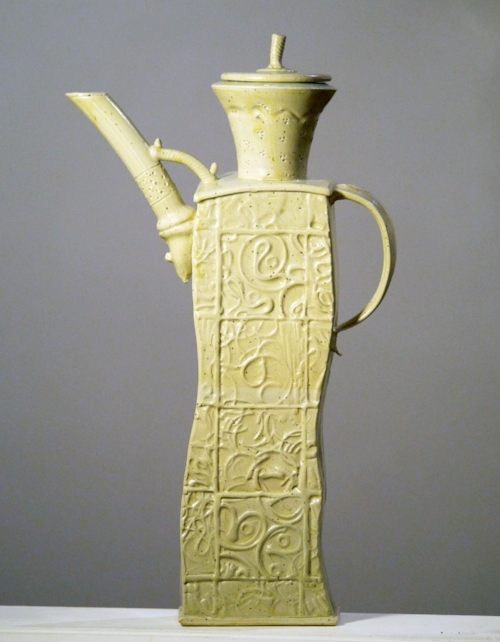 This piece, "Tea Pot" placed second at the Blue Ridge Arts Center Juried Exhibition in Seneca SC. This teapot was selected to be on exhibit in the Palmetto Hands Exhibit Traveling Show 2018 calendar year. 7th Annual ART ON THE TRAIL, held at Trailblazer Park in Travelers Rest, SC on October 20, 10:00 a.m. - 4:00 p.m.
"My work is not limited to just throwing on the wheel or hand-building. I do not want to limit myself to one type of firing, one clay, one technique of decorating, or one glaze. Each creative idea demands its own method of construction and finish. Each new material, technique or tool suggests something different to try. I want my work to be good not only now, but 10, 100, 1000 years from now; to be timeless and distinct."